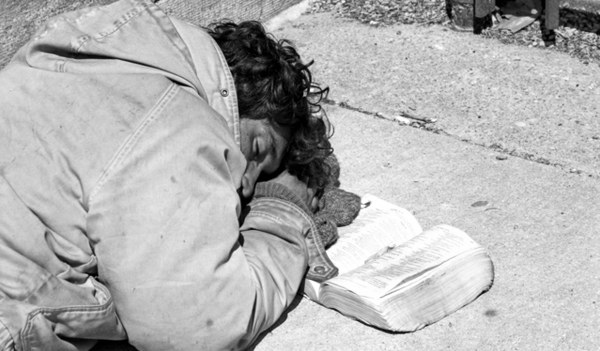 I was hungry and you gave me food, I was thirsty and you gave me drink, I was a stranger and you welcomed me, I was naked and you clothed me, I was sick and you visited me, I was in prison and you came to me (Matthew 25:35-36). In Jesus’ famous description of the judgment day in Matthew 25, he describes those on his right hand (the children of God) as those who have personally ministered to Jesus in his poverty, in his sickness, and in his imprisonment. When the righteous understandably ask in credulity, “When did we ever do this to you, Jesus?”, he responds, “As you did it to one of the least of these my brothers, you did it to me” (40). Don’t fail to minister to them just because everyone else is forgetting them. Jesus gives us here a striking, two-fold description of his people: they are the ones who are ministering to the hungry, the thirsty, the outcast, the naked, the sick, and the imprisoned … and they are the ones who are hungry, thirsty, outcast, naked, sick, and in prison! Jesus is not only reminding us that God’s children should be engaged in charitable, philanthropic endeavors. He is saying: your brothers and sisters in Christ are found among some of the lowest and weakest and most hurting people in the world! Don’t forget about them; don’t fail to minister to them just because everyone else is forgetting them. It has always been true that genuine Christians are found in every economic and social strata of society. These are your brothers and sisters, and when you minister to them you are ministering to Jesus himself. We are not meant to only minister to Christians, but we should take special care that fellow believers are not left uncared for. Surely there is some opportunity to put this lesson to practice in your life today? Look for the person(s) that everyone else is ignoring, or despising, or mocking; and show them love, show them respect, stand up for them. In Jesus’ name, for Jesus’ sake. Visit Jesus in jail. Sing to Jesus in the nursing home. Feed Jesus at the homeless shelter. Stand up for Jesus on the play ground. Welcome Jesus into your home through the foster care system.